Contrabando Canyon, an aptly named dry wash that cuts through the Chihuahuan Desert to the Rio Grande, has probably seen its share of travelers, smugglers and bandits. 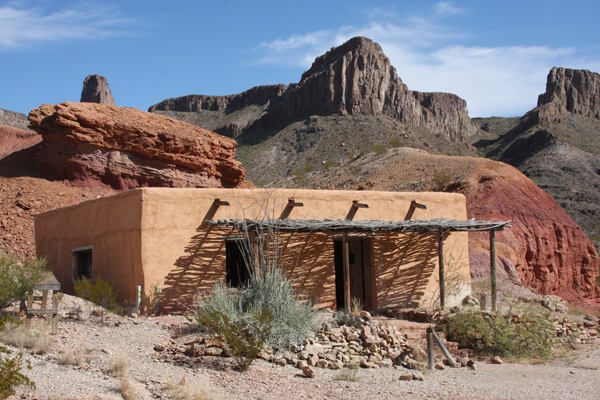 This adobe is part of a small village near the mouth of the canyon just off Farm to Market 170, a scenic highway that cuts across Big Bend Ranch State Park between Lajitas and Presidio, Texas. The Rio Grande, a thin blue border that keeps Texas just a short wade from Mexico. flows quietly a few feet away. Except for the occasional car on the blacktop and the bleating of goats on the Mexican side, there is little sound. You might think you have found something old and wild, but looks can be deceiving. Inside, the house is a shell, part of an abandoned movie set. Built in 1985, it has been used to film scenes from eight movies like "Dead Man's Walk" and "Rio Diablo." This shot was taken on one of our earlier visits to the Big Bend area.